Elegant townhouses, 2 bedrooms, 3.5 bathrooms, laundry, living room, walk in closet, garage for one car, ocean view nested in surfing town Rincon! This is the perfect romantic or family getaway. Watch the sunset at beach that are few steps away. Very near all attractions. On arriving you will find a brochure with all things to do from watersports to the secret place to the best breakfast in town! The beach is 150 feet away from the house. You can even hear the waves at night. The ocean is calmer on this side and most suitable for swimming. This is where families go with their children. Our house also has a dipping pool that is 3 feet so its perfect size for a family. We are just a call away for any questions or concerns at anytime. Property manager is available to assist you throughout your stay and is just a phone call away at anytime time. 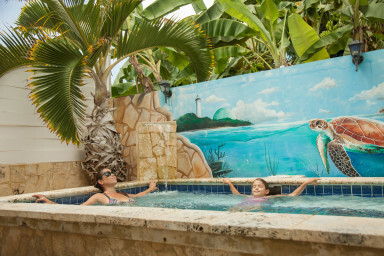 We are set in a family friendly neighborhood near the beach. Just a short stroll down the shore, you will find the Cofresi Beach Bar specializing in drinks served in a coconut, as well as water sports rentals and activities, and one of the best local cuisine restaurants in the area, La Ana de Cofresi. We're also just a couple blocks from Lucky 13 BBQ, serving breakfast, lunch, and dinner daily. The Rincon Shopping Center is also near-by and Edward's Food Mart has a great variety of imported, local, organic, and gluten-free foods to complement all your gastronomical tastes and needs. The downtown area is less than a 5 minute drive. Check-out the local Plaza, with a variety of shops and restaurants. The Plaza also hosts the Sunday Farmer's Market and Thursday Art Walk with live music, arts, and crafts. The Best surfing beaches on the island are just a 5 minute drive. Visit the Rincon Lighthouse Park for spectacular whale watching, vendors, and mountain bike trails. Rincon has something to offer for everyone! Additional fees: a 7% lodging tax will be added to the reservation total.